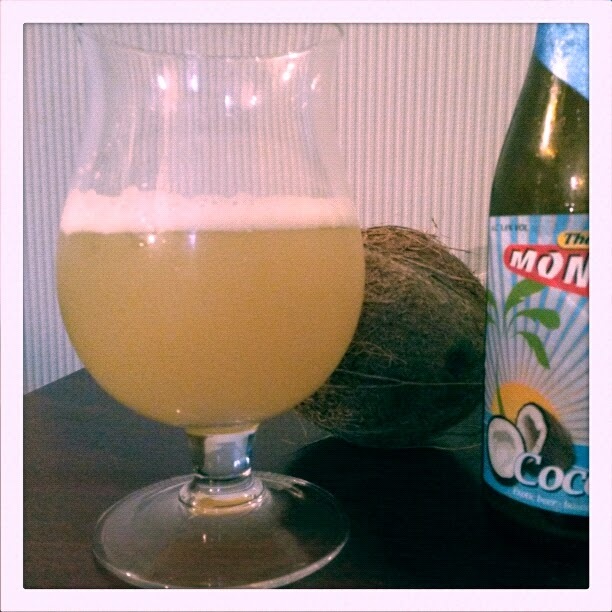 For months now my girlfriend Emma has been on at me to review Mongozo Coconut, one of her favourite beers and also (brace for romanticism) one of the first beers (outside of our now legendary one-night completion of the bottle and can list our local Wetherspoon’s) I shared with her. So here it is, typed the beer hack as he caved to the pressure of an incessant Glaswegian. Mongozo Coconut. Your correspondent’s living room stinks of coconut now. This particular bottle poured incredibly lively, even left to settle for more than an hour. Coconut beer went everywhere and the room now has a powerful poolside vibe. 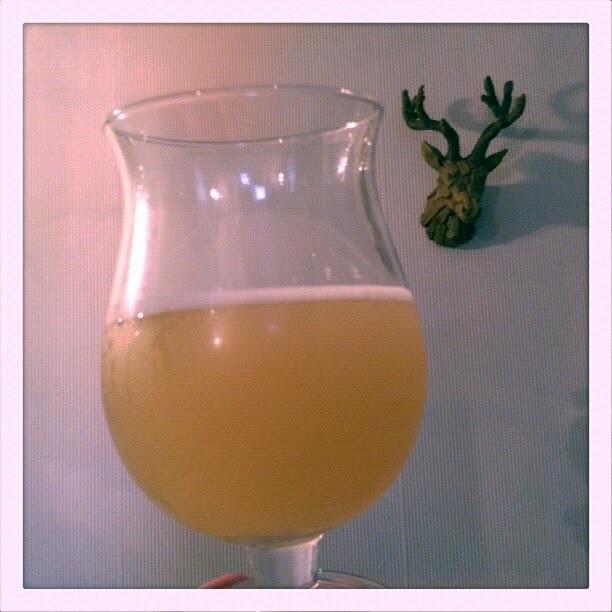 Mongozo Coconut, after soaking my £5 second-hand-at-least beerglass cabinet, pours to beautiful pale yellow that seems to darken as you walk around the room holding it, and which deserves its own closeup. Head is at first effervescent, raucous and furniture-ruining but calms to a 3mm band of snow, of perhaps the cleanest of white sand. The scent from glass fills the room. Even stepping away from the cabinet that is now soaked thank you very much the aroma of summer holidays is tangible. Sniffed from the glass the drinker is walloped with the suntan lotion scent of coconuts, with a raw and bright fertility in the scent. The first taste is coconut to the maximum, with both bitter and sweet notes of the same flavour seemingly jostling for position. The sweetness wins out after a couple of mouthfuls as the flavour blossoms almost to the point of sensory overload. 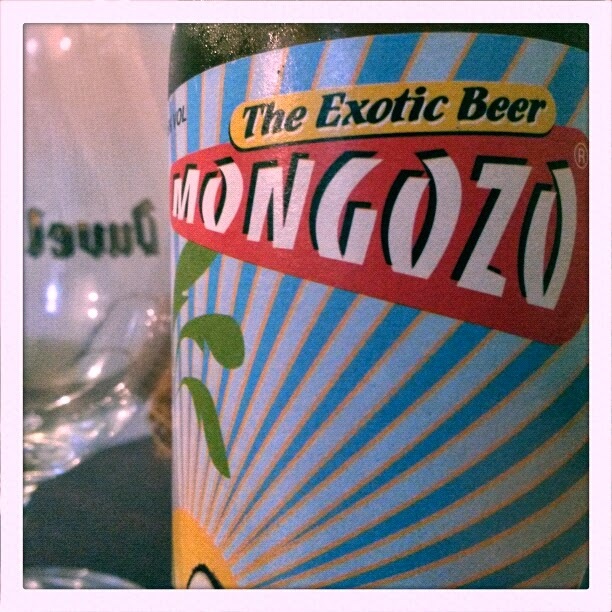 Mongozo coconut may look like a novelty beer but it packs some serious heat. Its taste is simply massive, despite its 3.6% abv. There is little carbonation, enough to sparkle-up the tastebuds before the bubbles dissipate, and the texture is a session-friendly middleweight, drinkable in the extreme without being skinny and waifish on the senses. A tulip glass with only a couple of fingers of Mongozo Coconut remaining is a powerful thing indeed, a wellspring of invisibly heaving coconut musk that smells intoxicating and decadent. There is very little thinning out of the flavour as the glass empties. The aftertaste lingers and becomes tart and sticky on the tongue, begging to be topped up with another bottle of coconut exoticism. Unfortunately I only bought two, and the other one’s got my special lady’s name on it.